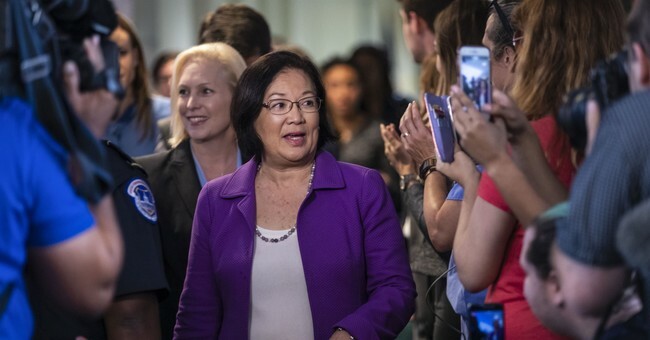 Sen. Mazie Hirono (D-HI) has given Supreme Court nominee Brett Kavanaugh little benefit of the doubt throughout the last week of accusations. His accuser, Christine Blasey Ford, insists that the nominee assaulted her 36 years ago when the two were in high school. But, right now it's a matter of he said, she said. He says it didn't happen. Ford has been invited to tell her story before the Senate Judiciary Committee in an open hearing on Thursday. In the midst of the back and forth, Hirono said men in this country need to "shut up." CNN's Jake Tapper brought her on his show Sunday and, per usual, had a good question for his guest. Doesn't Kavanaugh deserve to be presumed innocent until proven guilty? Her answer was, well, confusing at best. "His credibility is already very questionable in my mind and in the minds of a lot of my fellow Judiciary Committee members - the Democrats," Hirono explained. Kavanaugh "has an ideological agenda" that is "very outcome driven," Hirono continued. He has an "inability to be fair," especially when it comes to women's reproductive choice, she noted. "It sounds like because you don't trust him on policy and because you don't believe him, when he says for instance he does not have an opinion on Roe v. Wade, you don't believe him on this allegation about what happened at this party in 1982," Tapper observed. Hirono didn't reject Tapper's analysis, she said she just wants an FBI investigation into the incident. In fact, in a previous interview, Hirono candidly revealed that she and her fellow Democrats aim to keep retiring Justice Anthony Kennedy's Supreme Court seat vacant until 2021. Supreme Court Justice Ruth Bader Ginsburg recently lamented the state of today's cutthroat politics. Back in her day, she noted, the Senate voted for her overwhelmingly. Her ideology had little to do with her confirmation. "I wish I could wave a magic wand and have it go back to the way it was," Ginsburg said.